Summit Daily/Ashley DicksonEmily Thompson's dog, Shadow, needs surgery on both rear legs. 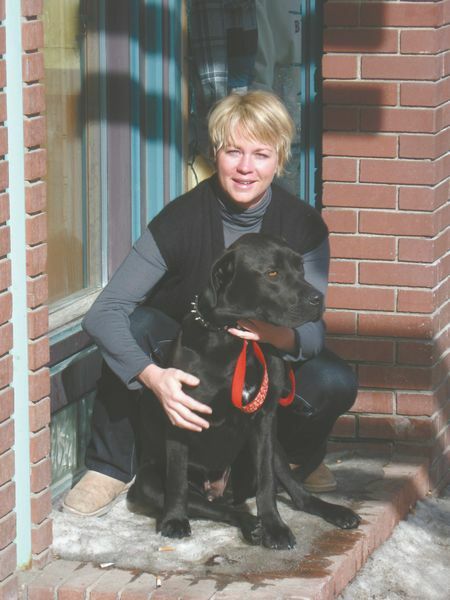 To help pay for it, Thompson received support from her colleagues and boss at Clint's Bakery to make dog biscuits that she sells at the Breckenridge eatery and in local pet stores. BRECKENRIDGE ” Limping gingerly so as to not put any pressure on his back legs, Shadow, a black lab and pit-bull mix, looks like he is suffering from an injury or old age. But, at just a little over one year old, Shadow suffers from a genetic abnormality that has caused him to have poor hips and joint fusions in his two hind legs. Numerous X-rays later, the veterinarian concluded that Shadow would need surgery as soon as possible to prevent debilitating lameness. A dog-lover all her life, Thompson immediately fell in love with Shadow when she found him at a shelter in Hawaii, but the dog’s medical prognosis left her shaken and unsure of her next step. The surgery costs $4,500 for both legs, and Thompson, knowing she couldn’t raise the money without help, turned to her fellow employees at Clint’s Bakery in Breckenridge for advice. With help from family and friends, the crew at Clint’s Bakery quickly went to work during the bakery’s off-hours, rolling out peanut butter-flavored dough to produce 70 dozen dog biscuits. Dog biscuits were flying off the shelves when the bakery first started selling them a few weeks ago, prompting Thompson to prepare a second batch that will go on sale today. The dog biscuits are selling for $5 for a bag of 12 and can also be purchased at The Barnyard and the Elk Mountain Trading Company in Frisco. Those interested in making donations toward Shadow’s surgery can contact Thompson at (808) 854-4415.